We've been shuffling bedrooms around the past few weeks. It's been a little tricky to find an arrangement that would make everyone happy and allow us to have the space we need. We settled on having the boys share a room upstairs and moving Edith to her own space (which used to be Ethan's room) downstairs. 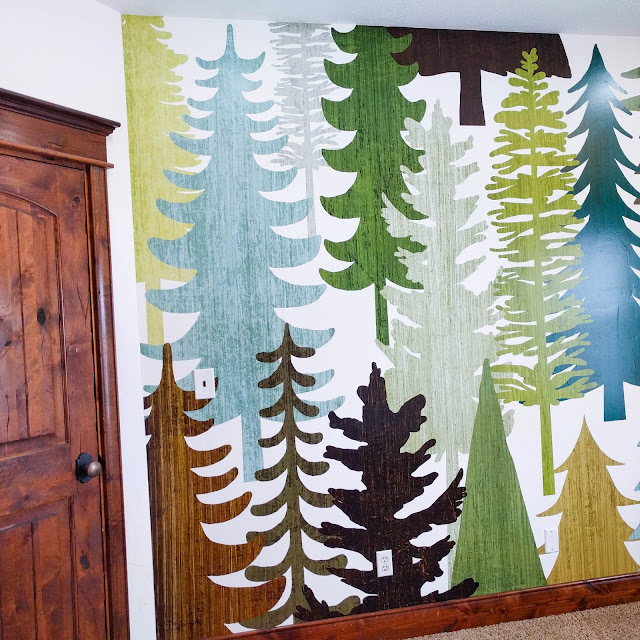 In order to help everyone feel okay about that, we needed to spend some time fixing up the boys' room. You can see how this room used to look (and here). 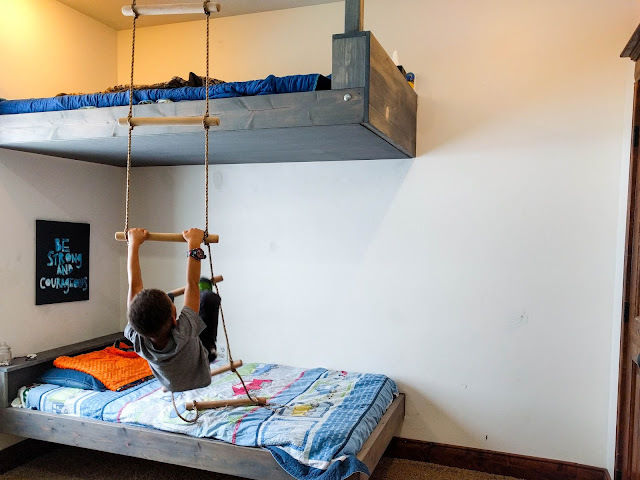 Jason designed and built some really amazing bunk beds. We stained them Classic Gray and I love the simple look he came up with. They each have a shelf for books or treasures and room for a reading light that will come in the future. Jason also hung a rope ladder as the way to climb up to the top bunk. 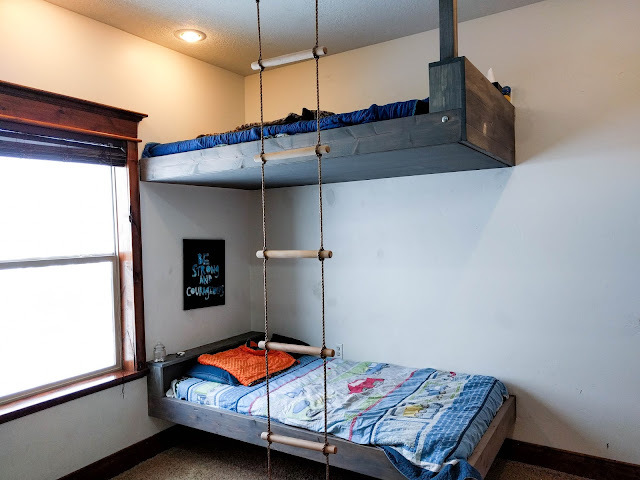 It doubles as a fun swinging/climbing/hanging feature for our boys to play on. Which is especially awesome for our little one with Sensory Processing Disorder. 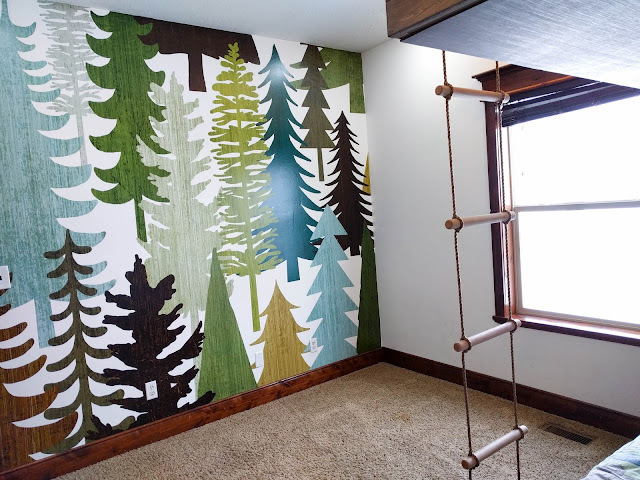 When Photowall contacted me about trying out one of their wall murals, I was so excited to find something that would work for this room. I fell in love with this tree print and ordered it right away. Jason and I hung the mural together one Saturday afternoon. 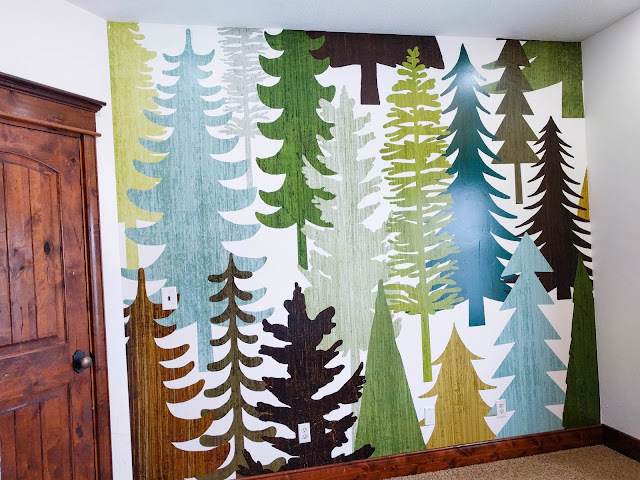 Neither of us have ever hung wallpaper before, but it was really pretty easy. The instructions are clear, the kit came with everything we needed and I am over the moon happy with the result. It makes me happy every time I walk by this room. If you look closely, you'll see that we still have a little paint touch-up to do, but other than that this project is complete. And I think it makes a pretty awesome space for our boys. This post contains affiliate links. At no extra cost to you, I receive a small amount when you purchase something through those links. Thanks for supporting A Lively Hope! I received the mural for free to include in this post, but the opinions shared are my own.